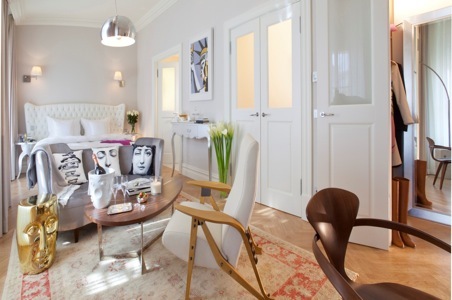 The Sans Souci Wein is a spectacular boutique hotel and hotspot featuring original artwork by Steve Kaufman, Allen Jones, and Roy Lichtenstein, and located in Vienna, Austria’s artsy Spittelberg district just minutes from MuseumsQuartier. Phillipe Starck design group Yoo recently restored and redesigned this 1872 historical building, merging Viennese architecture with modern design, and antique and modernist furnishings. 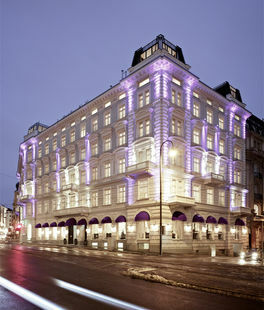 The hotel’s 63 rooms are each uniquely styled with furniture designed by Antonio Gaudi and Arne Jacobsen, parquet floors, gold murals, and marble bathrooms. A 20 meter long swimming pool is the oasis and focal point of San Souci’s amazing spa offerings. More than half of the art inside the Hotel Sans Souci is from the owner’s private collection, making the hotel into an brilliant art gallery for guests. American Pop Art, Inc. welcomes you to visit their website at http://www.sanssouci-wien.com/en/index.html.